Shruti Haasan came with her dad Kamal Haasan to support her sister Akshara who debuts in Shamitabh. 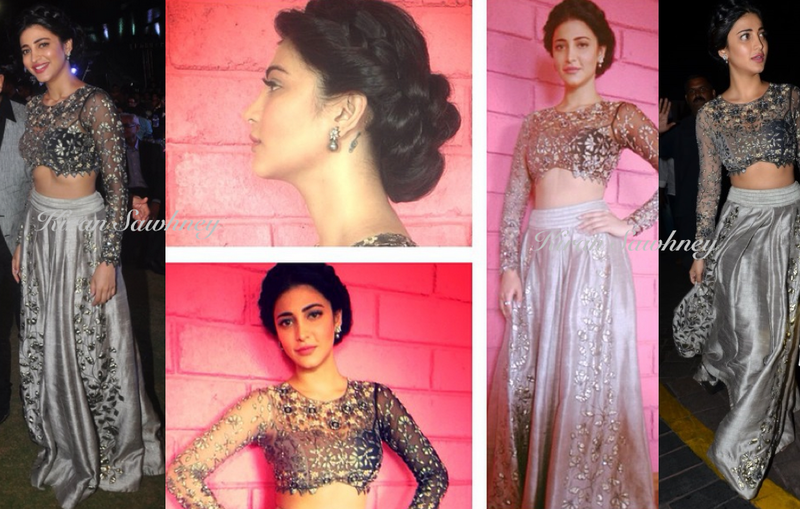 Shruti wore a silver lehenga by Arpita Mehta. It had a net blouse and silk embroidered lehenga. She carried a matching silver potli and finished the look with a very interesting braided bun. Anyone else feels that a duppatta would have completed the look? Specially, because it has a sheer blouse. Without a duppatta, the look feels incomplete and looks more like embellished petticoat and blouse. The makeup and hair artist did a good job, though.